Ford is looking to collect the remaining fibers and use it for exterior and interior parts. 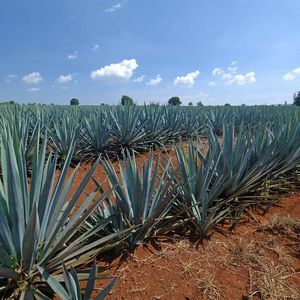 Ford and tequila producer Jose Cuervo are collaborating to test the use of leftover agave plant fibers as a source of sustainable bioplastic. Parts made using the material could help the automaker manufacture lighter, and therefore more fuel-efficient, vehicles while reducing its environmental footprint. Automakers currently use plastic made from petroleum and natural gas, making the fibers left over from the distillation process a greener alternative. After Jose Cuervo harvests an agave plant it is roasted, pressed, fermented, and distilled to make tequila. The process results in leftover agave fibers that the producer uses as compost. Ford is looking to collect the remaining fibers – and there are a lot, as Jose Cuervo harvests roughly 200 to 300 tons of agave per day – and use it for exterior and interior parts. Ford's initial tests on the eco-friendly plastic show that it's good-looking and tough enough to be used for cup holders, fuse boxes, HVAC units, coin dishes, wiring harnesses, and storage bins. It sounds as though it's not ideal for high-strength structural applications, which may still require traditional plastics. This isn't the first time Ford has looked into creating components with environmentally friendly materials. And the automaker isn't the only one to attempt to reduce its environmental footprint through materials as Ford, Hyundai, and others uses soy-based seating foam that ditches petroleum-based substances.